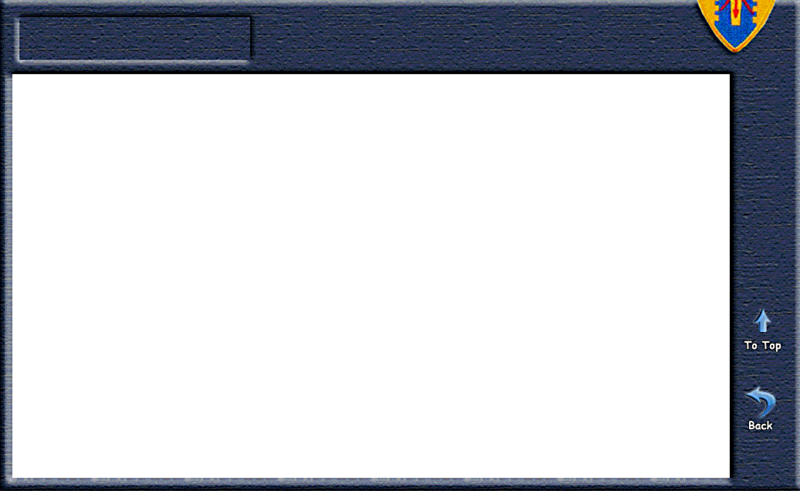 The BS Card is built from a Centaurs' page ("MyPage") on the website. The BS Card is built from a Centaurs' page on the website ("MyPage"). If you do not have a page (a MyPage), then send me the photos and information needed so that I can make one for you. The BS Card comes after that. If you are not happy with your current MyPage photo, let me know so we can get it changed before printing BS Cards. Note 1: The items done for the website, like MyPages, are all done in "pixels" and at 72 dots per inch (dpi). This is the "Digital" world. In the "Printing" world, graphics are done in "inches" and at 300 dots per inch or better. Standard business card size is 3.5 x 2 inches. Note 2: Building "My Pages" for our website is my top priority. Creating the graphics to have a BS card made (a time consuming job) is secondary to all website activities. Priority for creating the cards will go to those who are attending Reunions. STEP 1 - Send me a request for a draft graphic of your card to be created from your MyPage information. A simple email will do, like "I want a BS Card. My phone number and email address for the card are …….and …….."
STEP 2 - I will email you a draft graphic of your card for any changes or corrections you would like made. This draft graphic is not for printing; just for your review (low resolution). Look at it and make sure all your data is correct. If you live in two places, list your primary residence first then your snowbird town second. 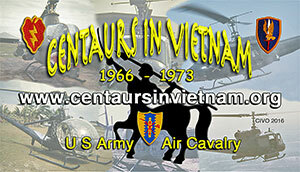 If you are a member of the Centaur Society, that logo will be included on your card. Email that info and corrections back to me. Call me with any questions: 619-823-0992. STEP 3 - Since there are many ways to get your cards made, I will create two sets of graphics that can be used for most any procedure you choose. These will be made available on the website for downloading by you as compressed files. a. For Commercial Printing use the set of single graphics of each side of your card (front and back). •This option can be done online by emailing these photos to any company that does Business Cards or taking them into any print shop or print service store. •These graphics are slightly larger than your final card size of 3.5 by 2 inches to allow for trimming errors in the cutting machine (called bleeding the edges). •The cost is around $40 and provides 150 to 250 cards. •It usually takes a week or so to get them back, either by mail from an online order or pickup at the store. b. For Manual Printing (like in "do it yourself") use the 8up version of the graphics (8 images per page). This set has 4 images of each side of your card per page (called 8up). There are 4 graphics of the front of the card with the Centaur logo that are on the left side of the page. Four images of your Mypage side of the card are on the right side of the page. These are for use in making smaller quantities of the cards with manual cuts. This one page of 8up is printed on both sides of the paper or card stock. Be sure to flip the page horizontally for printing of the second side. This will allow the cards to line up properly for cutting. •This option can be done at home on your printer (not recommended) or at a local print service shop like Staples, Office Max or Office Depot. •The Print Shop (like Staples of Office Max) can download your graphics directly from our website or you can download them and take into the shop on a portable (thumb) drive. •Each page has a large alignment cross in the center. •The cards with the big Centaur logo (Front side) are oversized to allow for trimming errors. The side with your MyPage photo is also a bit oversized for trimming errors. Always cut from the MyPage side. •I recommend using glossy card stock (but it needs to be glossy on both sides). Matte card stock is cheaper. •Print one page both sides (remembering to flip the page horizontally in the printer tray), then hold up to the light and see if the alignment crosses are within an eighth of an inch or so of each other both up and down. •Stores have a paper cutter that you can use for free. Stores will cut them for you for a fee (like 75 cents a cut). How to cut the Cards? 1. Take a look at the vertical red line "A" in top right corner (the "A" is blue). Estimate where that line cuts thru the right side of the cards. This line will not be available to you after you make the other cuts. So you will have to remember about where it goes. (Note that when you get to this point, If you have a paper cutter with measure marks, just set it for 3.5 inches and cut). 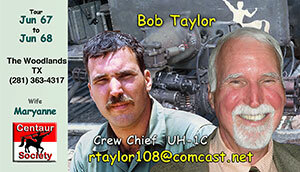 Business card standard size is 3.5 inches wide and 2 inches tall. 2. Cut the two sided paper vertically along line 1 (Down the left side of the Mypage side of the cards). 3. Take that right hand piece of the paper and cut it horizontally along lines 2 thru 9 (This should provide the 2 inch height for each card). 4. Use your visual estimate (or set your paper cutter to 3.5 inches) and trim the right side of the Mypage cards. 5. Move to the other side of the original paper, turn it over to the Mypage side and cut it in the same manner. How many cards do I need? That is a personal decision, but consider this: the card is fun to pass out and people seem to enjoy receiving it. The more that are circulated, the more exposure our website gets. More exposure could mean finding more Centaurs. If your phone number and email address is not going to change these cards will be good for a longer period of time. If you are going to the 3/4 Cav Reunion and you get a chance to talk to just half of the Centaurs and other Troopers, you could use up 50 cards quickly. These are also handy for other reunions like VHPA or even your class reunion. DIY: If you are doing it yourself (printing on your own printer, or printing at a shop and manually cutting them) then you only need to download the compressed file that I will send to you. It contains the single graphic for the front side that would be used for commercial printing (which you won't need in this case), and the 8up graphic with your photos (which is all you need for the do it yourself cards). Commercial: If you wish to have a commercial printer do it, you have to download both compressed files. 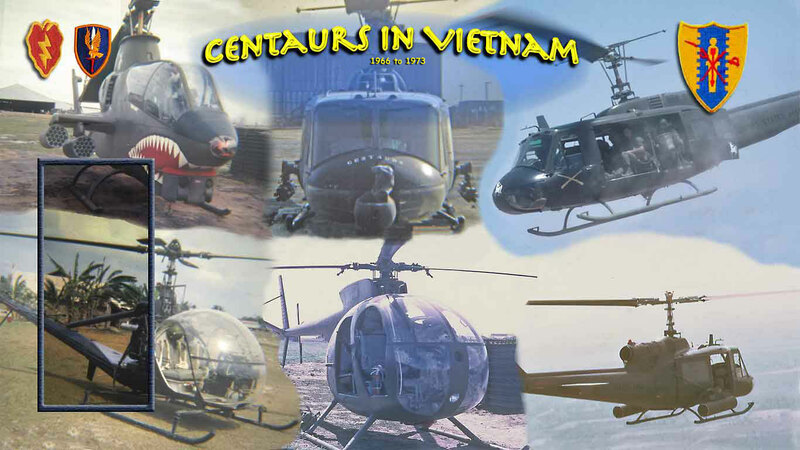 The one mentioned above and also the Front Side graphic (a single graphic of the front side with the Centaur logo). You can download and uncompress them yourself, then email the two graphics (front and back; not the 8up) to a print vendor on the internet. This option is the cheapest and easiest if you want a 150 cards or more. You can also pay a little more and get fancy with raised letters and heavier card stock. Sometime ago we decided that we had to do something about all those old faces at the reunion. Who the hell are they? The name tags really help (if they are not turned backwards). However, 5 minutes after meeting whats his name you can't remember the name, or his wife's name, or where he lives, or how to get ahold of him. Enter the "Brain Supplement Card". Exchange cards to help remember all these things and as a record of who you may have met and talked to. Now you have a record and some personal info. Very handy. We discovered that reunions were not the only place where the cards were quite handy. In everyday life we run into people who ask about our service. After a hopefully short conversation, give them a card. It helps them remember you and is a plug for our website. More people go to the website because of this. More hits helps to grow the influence of the website, therefore giving us better chances of finding more Centaurs. Civilians seem to get a kick out of getting a card from a Vietnam Vet. 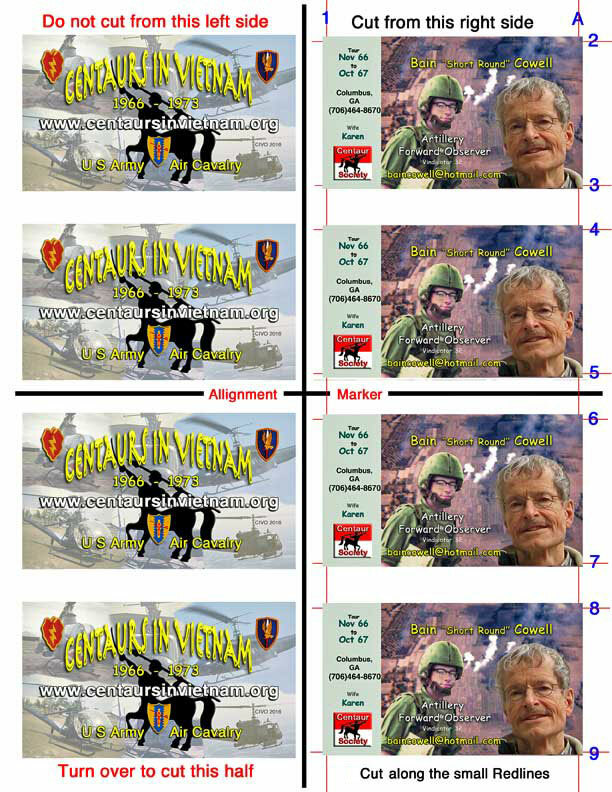 Their input caused us to improve the card by adding the words "US Army" and "Air Cavalry". Those not understaning our nice looking patches, logo or terminology often asked what branch of the service were you in. Several didn't pick up on the aircraft in the background so they have no idea what we did. "Air Cavalry" says a lot towards that.